Technically, under the 1950 convention on refugees it could be argued that this child qualifies for refugee status based in the fact that he is fleeing his country because children, a specific social group, is being targeted by cartels for recruitment/coerced violence. However, the US is conducting mass-deportations of influxes of people coming in claiming they are illegal immigrants. This is being argued on the grounds that the people are fleeing crime—not persecution. Additionally, it has been stated that qualifying all people who are fleeing crime as refugees would open the door for any person in Latin America to legally come to the US; therefore, it is too broad and not feasible. He is not considered a refugee, and he is subject to deportation. This family has been specifically targeted by the government because of their political opinion. This young girl was fled her country because of a well-founded fear of persecution because of her religion. She also could not return home because if she had, it is very likely that she would have been killed or put into a concentration camp. Because he and the other people from Aleppo are still within the borders of Syria, they do not qualify as refuges—they must across the borders of their home country. Additionally, because they have not crossed their borders, they are not able to receive any of the assistance refugees do—they are technically still under the protection of their countries government. ​On May 23, 2016, the World Affairs Council – Washington, DC hosted His Excellency Dr. Hamdullah Mohib, Ambassador of Afghanistan to the US. Ambassador Mohib delivered remarks to a full house at the Ronald Reagan Building and International Trade Center. The audience was comprised of WAC-DC members, correspondents of domestic and international press, representatives of diplomatic delegations, and members of the general public. The event was aired live by CSPAN-2, CSPAN Radio, and was recorded by Voice of America and Ariana Television Network (Afghanistan). 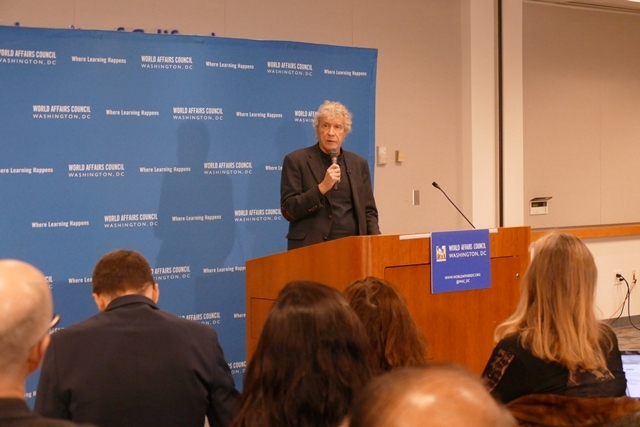 ​The World Affairs Council-Washington DC hosted an author series event on March 2, 2016 with John Perkins to discuss his book, "The New Confessions of an Economic Hitman." Mr. Perkins' remarks touched on several ideas relating to his career as a global economist and our world today; plus personal stories and objective truths calling for a change in each individual’s mindset. 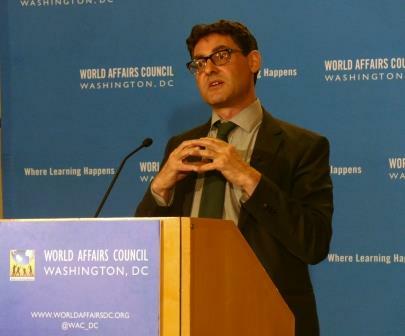 ​The World Affairs Council – Washington, D.C. had the honor to host Mr. Nicolas Pelham for an Author Series event to deliberate the cultural and political complexities of the Middle East. In his recently published book, Holy Lands: Reviving Pluralism in the Middle East, Mr. Pelham believes that tolerance and pluralism within societies can resolve sectarian struggles. 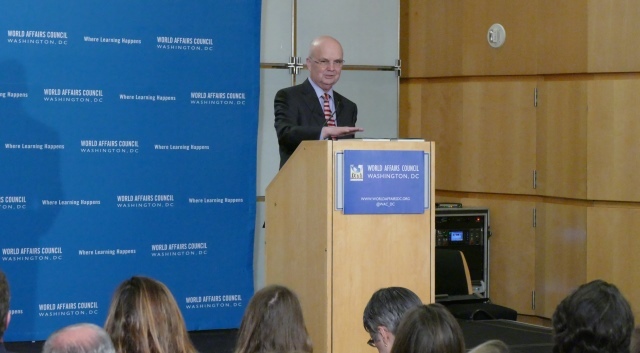 On March 23, 2016 the World Affairs Council-Washington, DC hosted General Michael Hayden at the Ronald Reagan Building and International Trade Center to discuss his book, "Playing to the Edge: American Intelligence in the Age of Terror." On February 11, 2016, the Embassy of the Republic of Egypt in Washington, hosted the World Affairs Council-Washington, DC’s members, Board of Directors, and distinguished guests for an Embassy Series event. The program began with opening remarks by WAC-DC President and CEO, Tony Culley-Foster, who provided an overview of current bilateral affairs, highlighting notable joint ventures between the United States and Egypt. His Excellency Yasser Reda, Ambassador of Egypt to the U.S. welcomed guests and began his remarks by stating that he believes strongly in grassroots diplomacy and its ability to make a difference in the world. Because of this sentiment, he appreciates the work of the Council and its ability to reach people directly. His Excellency gave a brief overview for the guests of the last five years of bilateral relations between Egypt and the U.S., stating that both countries can continue to grow as security and economic partners in the international community. The Ambassador said he looks forward to helping facilitate a more active ‘open-door’ policy between Egypt and the U.S. Ambassador Reda explained that it is Egypt’s goal to play a positive role in the international community by being a center for mutual understanding and peace in the Middle East. One of the biggest priorities that both Egypt and the United States share, emphasized Ambassador Reda, is preventing terrorism through stability and security in the region. During the question and answer session of the program, many of the attendees asked the Ambassador about the negative effects of weak global markets and low oil prices on the Egyptian economy. The Embassy’s Chief Economic Officer explained that in contrast to what is reported investors are seeing a great return from their investments in the Egyptian markets. At the conclusion of the program, guests mingled with embassy officials while sampling traditional Egyptian food and drinks including falafel and baklava. 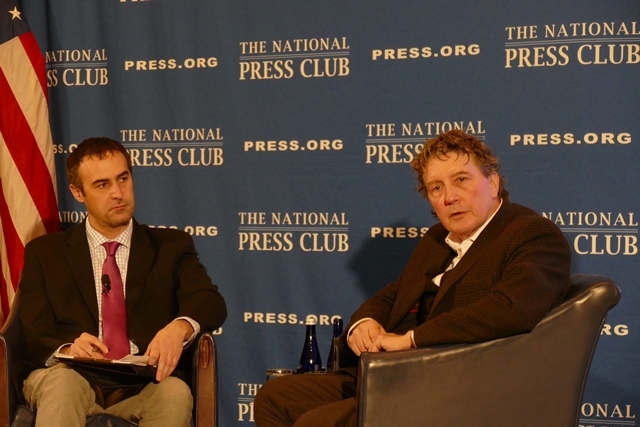 ​On February 10, 2016 the World Affairs Council-Washington, DC co-hosted the author Rod Nordland at the National Press Club to discuss his book, THE LOVERS: Afghanistan’s Romeo and Juliet: The True Story of How They Defied Their Families and Escaped an Honor Killing. Nordland is a National Press Club member and an international correspondent at large for The New York Times. He has worked as a reporter in more than 150 countries. On December 14, 2015 the Embassy of Afghanistan in Washington, DC hosted the World Affairs Council-Washington, DC’s members, Board members, and distinguished guests. The event began with opening remarks by World Affairs Council- Washington, DC President and CEO Mr. Tony Culley-Foster. He highlighted some of the joint ventures that the United States and Afghanistan have entered, in addition to providing an overview of current affairs in Afghanistan. Mr. Culley-Foster also introduced the discussant for the evening Ambassador Ronald Neumann, president of The American Academy of Diplomacy and former US Ambassador to Afghanistan. 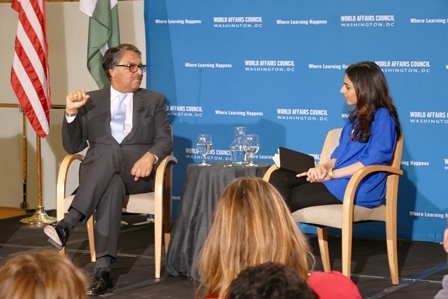 Pakistan's Ambassador to the United States, Jalil Abbas Jilani, collaborated with the World Affairs Council, DC on December 8 as part of the organization's Ambassador Series. Dr. Madiha Afzal, assistant professor at the University of Maryland's School of Public Policy, moderated the event, which analyzed the ever-evolving role of Pakistan in geopolitics and detailed the continual transformation of public policy and social climate within the nation over the last half-century. Mr. Jilani opened the discussion by mentioning some of the general steps that Pakistan has been taking to promote education, reform the Madrassa system and address regional security challenges that the nation is currently facing. He then went in depth on the significance of the U.S.-Pakistan relationship, which has existed since its founding in 1947. 180 high school students joined the World Affairs Council-Washington, DC on Tuesday, December 8 to participate in the WAC-DC Youth Forum on Climate Change. 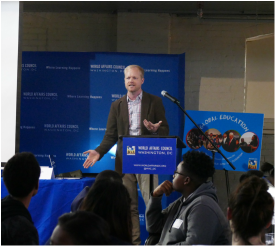 This conference, which took place at the historic Thurgood Marshall Center in DC’s Shaw neighborhood, featured an engaging and informative series of expert speakers, youth leaders, and a simulation activity that provided DC area students a unique opportunity to explore the realities of climate change and further understand how they can work to create a solution.